Mission: Empowered Youth is devoted to developing a comprehensive, sustainable curricula and programming that provides support, resources and opportunities for our community's most marginalized and underserved youth, specializing in job training and development. Methodology: We serve youth from unconventional circumstancs with unconventional solutions. Our goal is sustainable transformation. Youth Transformation through Opportunity. This is Empowered Youth. Discover the story of our organization and meet some of our students during this 20 minutes-long video. The Empowered Youth family during one of our regular program nights. Become a mentor and join us every Monday and Wednesday night at Gwen Cherry Park in Liberty City. Help us help our students to become Ambassadors of Change! Jesus and Bryan told their stories at the presentation of "Hope in the Hood" in June. Offers the DJJ-approved Botvin Life Skills curriculum The Empowered Youth Neighborhood Program is a community-based Intervention/Diversion Program designed to help our students re-direct their lives and break the cycle of recidivism. What EYN offers: - Character development - Activities aimed at restoring self-esteem, self-confidence, and trust - Academic tutoring - Referrals for individual, mental health, and drug counseling - Saturday Sports/Activities Program - Family support - Group and one-on-one mentoring Our goal is to provide support, resources, and opportunities to our students in order to better ensure their successful future. Our Job Development Program was specifically created to provide training and jobs for Empowered Youth Neighborhood students and graduates. The goal is to groom and train work-ready young men in the Culinary/Hospitality industries and to teach them how to become successful small business owners. The students receive: - Culinary and Food Truck Management training by professional chefs - Entrepreneurship training by the University of Miami - Nutrition training - ServSafe Credentials - On-the-job training on the Vibe 305 food truck/Café/Catering Our youths are paid a stipend while they learn. At completion of the 1-year Job Development Program, they are fully prepared to embrace a career in the hospitality/restaurant industry thanks to the meaningful job experience and references matured while working on the Vibe 305 Food Truck & Catering. Our current business models are the Vibe 305 Food Truck, Vibe 305 Catering, and the Vibe 305 Culinary Training Center & Café in Wynwood, scheduled to open in the Fall of 2017. The sole non-profit food truck in Miami-Dade, Vibe305 provides catering services to the community and employs Empowered Youth students and graduates. We offer a Culinary Class taught by a professional chef, as well as an Entrepreneurship Class taught by students at the University of Miami. 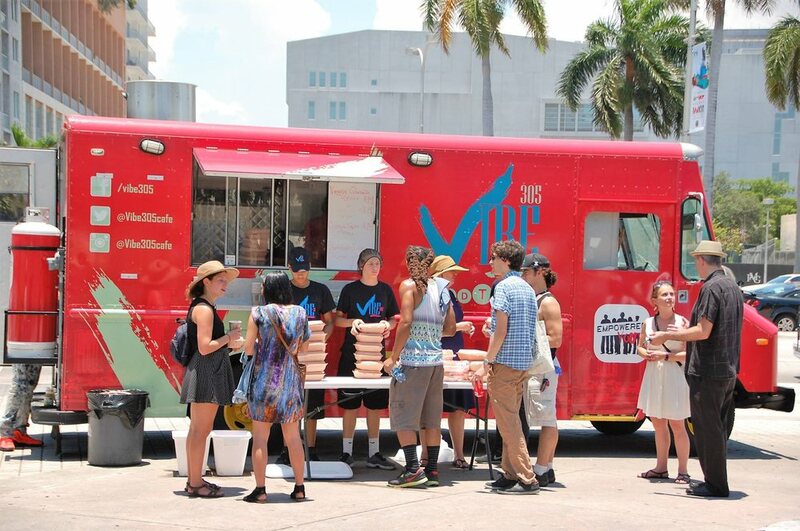 Sixty students have completed the Vibe 305 Food Truck Job Development Program since its inception, with many now working in Miami restaurants and hotels, attending college, or enlisted in the military. Over 90% of the participants of the Vibe 305 Food Truck Job Development Program have not re-offended.